Students at the SUNY College of Environmental Science and Forestry (ESF) placed first and second last month in the Slepecky Undergraduate Research Prize competition at Syracuse University. 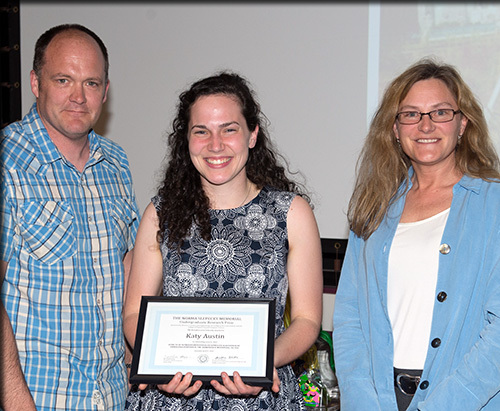 Katy Austin, an EFB undergraduate honors student in the Department of Environmental and Forest Biology, won first-place honors for her research on how nitrogen deposition from human activities affects the carnivorous purple pitcher plant in the Adirondack Mountains. She spent more than a year collecting and analyzing data for her study, then several months refining a paper that was submitted to a peer-reviewed journal. "Along the way, Katy worked with students and professors from ESF and Syracuse University and her work was exceptional," said her adviser, Dr. Mark Teece of the ESF Department of Chemistry. "The caliber of her work was outstanding and was the level that I typically see in a third-year graduate student." Finishing in a tie for second place was ESF student Cambria Ziemer, a junior in the Department of Environmental Resources Engineering (ERE). Ziemer's honors thesis focused on boundary-layer conditions of a shrub willow evapotranspiration cover. Shrub willow stands are often used to minimize percolation of rainfall on landfill covers. "Cambria's work provides information to improve the design and management of willow landfill covers," said Ziemer's field adviser, Dr. Anthony S. Eallonardo Jr., an ESF alumnus who is now a scientist at O'Brien & Gere. "Her work was outstanding because it nicely addressed a gap in the willow literature. She collected, analyzed and wrote up her data at a high level, on par with top graduate students. Her work provided very clear, helpful recommendations for the cleanup of areas associated with Onondaga Lake." Dr. Wendong Tao of ERE served as Ziemer's faculty adviser. Ziemer shared the second-place prize with SU junior Kristen Weeks, who is pursuing a triple major (biology, sociology and political science) in the College of Arts and Sciences. The Slepecky award is given in honor of the late Norma Slepecky, who was a distinguished auditory neuroanatomist and a Syracuse University faculty member. A professor of bioengineering and neuroscience in the College of Engineering and Computer Science and a member of the Institute for Sensory Research, Slepecky was a passionate researcher and an advocate for undergraduate student research. With her approval, Slepecky's family, friends and colleagues joined together to endow the Norma Slepecky Memorial Lectureship and Undergraduate Research Prize just prior to her death in 2001. The deans of the represented colleges designated Women in Science and Engineering (WiSE) as stewards for this lectureship and prize. WiSE supports persistence and success in STEM academic disciplines (science, technology, engineering and mathematics) for women, from freshman to faculty. To compete for the Slepecky Prize, students are required to submit documentary evidence of their research as undergraduates. The Norma Slepecky Undergraduate Research Award is designated to undergraduates in science and engineering, with strong encouragement for applications by young women researchers. The first award was given in 2004. Ten first-prize awards and 11 second-prize awards have been given since then. ESF students have been eligible to compete since 2011.